Medical student Nancy Adams (Blake Lively) takes a sabbatical from her studies after the death of her mother. She travels to Mexico, seeking the isolated beach where her mother went after discovering she was pregnant with Nancy. Once on the water, however, Nancy is attacked by a fiercely aggressive great white shark and finds herself trapped on a reef with no means of safely getting to shore. 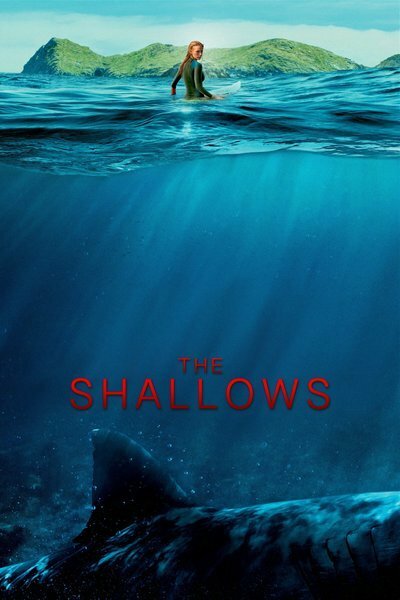 The Shallows, written by Anthony Jaswinski and directed by Jaume Collet-Serra, is a short and to the point thriller constructed from a deliberately limited premise. A young woman is injured and bleeding, without any apparent hope of rescue, with a very angry shark marauding the waters between her and the safety of the beach. Whether or not she finds a means of escape plays out over a tense 80-odd minutes. Deliberately confining the action of a feature film in this fashion is always a huge gamble. It can give a story an enormous amount of intimacy and tension, since we only really see what the protagonist sees and are never allowed to leave their side. On the other hand, it can limit a film’s visual opportunities – how many shots of a beach and a reef is an audience willing to look at? – and can rapidly get a little boring if there is not enough going on. In this particular case Collet-Serra has mixed success; this is a solid B-grade thriller, but it doesn’t transcend many genre expectations or stereotypes. It occasionally gets a little boring, but never so much that you do not want to see whether or not Nancy survives. Much of the weight of the film hangs on the shoulders of star Blake Lively, and she does an excellent job. It’s comparatively easy to act against another performer. It is much harder to act without another person to bounce off against. Lively is strong, likeable and engaging in the role. The film’s opening scenes do tend to objectify her somewhat, which comes across as a little tiresome after you sit through shot after shot of her deliberately framed cleavage. Once the action gets going, however, the film is not afraid to make her look increasingly battered and bloodied as her fight against the shark goes on. The shark itself is entirely computer-generated, and is for the most part very convincing. Its behaviour, of course, gets a little less believable with every attack, but only in ways that feel acceptable and par-for-the-course for this kind of potboiler. The only place things really stretch credulity is during the film’s climax, but by that stage the screenplay has already expanded audience credulity enough to by-and-large get away with it. The film’s greatest challenge is finding Nancy enough things to do in order to maintain the tension. There is an episodic series of encounters, including a few more hapless shark attack victims as the story goes on, but they don’t quite manage to sustain interest throughout the film. They leave gaps, and gaps are where you start asking all of the awkward questions that Collet-Serra would likely rather you didn’t ask. How does Nancy not go into shock? How can she shout for help when she hasn’t drunk anything in a day? How can she retain the strength to swim when she has a massive open wound oozing blood all the time? Visually the film is engaging and dynamic, with a very clever blend of location and studio footage keeping the illusion up that the entire movie was made out on the reef. Collet-Serra certainly has a good eye for photography and a strong editing sense. This is almost a really good film, but has to just settle for being a quite entertaining one instead.